We grow all the plants ourselves in our glasshouse that we rent from the London Borough of Waltham Forest. Work is carried out by a team of growers including members of our workers’ cooperative and lots of local volunteers who support the project’s aim to see more food growing in London. 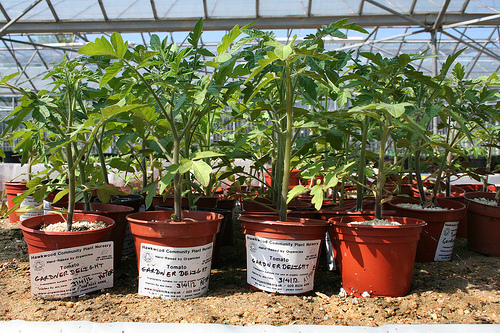 Plants are taken from the glasshouses and acclimatised to the outdoors before being dispatched. The plants are strong and healthy, ready to compete with weed seedlings and garden pests! Our main plant season is from April to July. We have some plants ready for sale, others are ‘sow to order’ and ready 4 weeks after ordering. Download the 2014 Plant List & Order Form to see what’s available this year. For bulk orders we need as much notice as possible but can offer a discount – and we can help you select a suitable range of plants, for example a school package with plants which will be ready to harvest and eat either before or after the summer holidays! And we hold plant sales at our Hawkwood Nursery growing site and at various markets throughout the season. We have popular favourites such as tomatoes, squash, courgettes and more on sale – plants that are hard to get started without a greenhouse, and we offer aftercare advice. During the season we will sell plants on Saturdays at our Hornbeam market stall, and on Sundays at Hawkwood Nursery on the dates below. At our Leytonstone Market Stall (Saturdays 11-3, outside Matalan) in May you can place an order for collection the following week and a small selection may be on immediate sale. Our box scheme customers can also place an order for delivery with their fruit and veg. Talk to us so we can help you get that food garden growing! We may be able to deliver larger orders for schools or ‘sow to order’. Cost for delivery (to cover fuel and driver costs) from £15 depending on distance. For box scheme customers we can deliver plant orders with fruit and veg bags to your pickup point. We also sell a range of hand-made composts; seed compost, potting-on compost and organic garden compost. Alex Collings – gardening at Somerford and Shacklewell Estate, Hackney. Along with many other accolades, this site was the winner of Capital Growth’s Edible Estate competition in 2010. Organiclea reuses plant pots. They can be returned to the Hawkwood Plant Nursery in Chingford, or the Hornbeam Centre in Walthamstow. Join Organiclea’s Orchard Project and help us plant over 200 fruit trees in the London Borough of Waltham Forest. Click on the image for more information.